A trailhead near Overbrook serves as the gateway to a section of the Landon Nature Trail developed in that area. TOPEKA, Kan. – Kanza Rail-Trails Conservancy has announced the Topeka Community Foundation has awarded a $10,000 Healthy Living grant for future development of the Landon Nature Trail, which stretches from Topeka to near Quenemo. KRTC said the grant will be used to develop another one-mile section of trail south of Overbrook. The trail has a 38-mile right of way in various states of development. Currently, the trail is completed from the trailhead at 17th and Monroe streets, in Topeka, to the Clinton Wildlife Area for a distance of 13 miles, and a one-mile section at Overbrook. The trail is a particularly scenic recreational trail, and when completed it will be the only recreational trail in America to link the Oregon National Historic Trail with the Santa Fe National Historic Trail. In the Landon trail’s northern section in Osage County, it follows picturesque Camp Creek among wooded oak and hickory covered hills that provide a shady tree canopy for trail users. The trail passes by two wetlands, native tallgrass prairie, and two waterfalls. Land surrounding the Swissvale waterfall lies within the trail corridor. 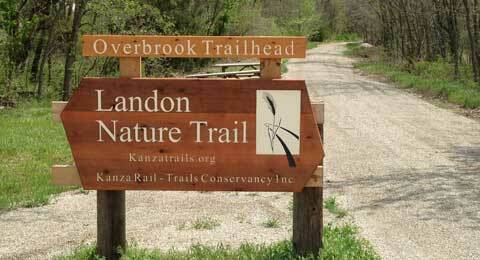 The Landon Trail crosses the Santa Fe Trail north of Overbrook. Near the trail’s southern terminus at Lomax is an historic 240-foot steel truss bridge over 110 Mile Creek. As currently operated, and once completed, the trail will be open to the public.